If you’re a long time reader of this blog, then you know I love businesses that do good things. Especially small businesses. Which is why I’m super excited to tell you all about Earth Divas. First, I need to do a quick disclaimer. I’m a commercial copywriter, and work with many clients on a regular basis. Earth Divas is one of my clients. But, that’s not why I’m highlighting them on my personal blog. This is an amazing small business that is 100% heart, and quite literally changing lives all over the world. I am thrilled and honored to be working with them. They have a wonderful story that I think you’d want to know about, which is why they’re getting a write up here. They are the only client I have ever featured here on the blog, which means they’re pretty special to me. So, what’s so special about Earth Divas? Well, let me start out by explaining what they do. 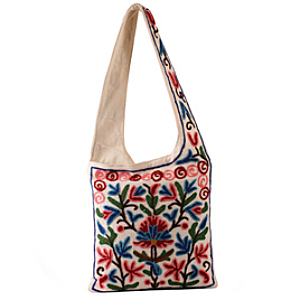 Earth Divas sources and sells handmade, fair trade products like bags, wallets, jewelry, and scarves. The products are made by women mainly in India and Nepal. Now, these women don’t have a lot of employment options. They can either stay at home, they can help on a farm, or they can get paid slave wages at a local factory. In rural areas, that’s pretty much it. This means that most of these women live at or below the poverty level. What’s so amazing about Earth Divas is that they go into these rural areas and give women another, better option. They use skills they already have, like knitting and sewing, and pay them fair wages to make beautiful products. Women that don’t have these skills are often trained at a women’s co-op that Earth Divas is collaborating with. Of course, the ripple effect of finally earning a fair wage is incredible. Thanks to their livable wage, these women can finally afford to feed their children more (and higher quality) food. They can afford more clothing and fuel to heat their homes. These purchases, in turn, lift up the shop owners they buy from. A few women in one village earning a fair wage can lift up the lives of several other families as well. Not to mention the sense of empowerment and self-confidence these women must feel at being able to earn as much, if not more, than their husbands. I’m not done with the goodness yet. What really stunned me about Earth Divas is that they’re not out to make a profit for themselves selling these fair trade products. Their goal (and they’ve reached it once already!) is to turn a profit so they can give back. When they make a profit, the goal is to give it all back to the artisans at the end of the year in the form of a bonus check. Ed, the owner, doesn’t take a salary. Ed’s goal this year is to get 100% of Earth Divas’s financial information up on the website. He wants complete transparency with his business, which I think is amazing. His philosophy is that if he’s able to give any profits back to his artisans, he wans to be able to prove that to his customers. Another cool thing is that many of the bags are made with recycled cotton or silk. And, a large percentage of the bags are made from hemp, a very sustainable, sturdy fabric. If you’d like to find out more on the artisans that make the products for Earth Divas, you can click here for their profiles.. I don’t often get to work with companies that I truly believe in, but I struck it lucky this time. This is a company whose values mirror my own, and probably yours as well. I believe that they’re worthy of our support. Here’s how it works: the more this little business grows, the more these artisans can earn at the end of the year. If it keeps growing, then Ed can hire more artisans to make bags and scarves. This means that more women will start earning a fair wage for their families. It’s a wonderful cycle. You can head over here to visit their shop if you want to take a look at what they offer. The bag I pictured above is my favorite one, the Kashmire Wool Crewl Work Bag. Isn’t is gorgeous? It’s hand crocheted by a woman’s co-op in Kashmire. If you want to keep up with fair trade fashion and fair trade news, then head over to Earth Divas’s Blog. I’ll be posting over there three times per week. You can also follow Earth Divas on Twitter at @EarthDivas01, or Fan the Facebook Page. I’ll be moderating both accounts in addition to running the blog. I’d love to hear your thoughts on this. And if you know any other companies that are changing lives and doing good like Earth Divas, I’d love to hear about them! Thanks for information! It’s nice to know that there is a moral company out there that sells ecofriendly products at a reasonable price. Next time I need a bag, I will head to their website. @Jennifer, thanks so much! They’re really wonderful. It’s been hard to resist buying one of their bags! I don’t need one, but they’re really gorgeous! @Heidi, Thank you for sending that link! I checked them out and LOVE their stuff. I’m vegetarian too, but there’s still things I’m learning (like about how cruel sheep are treated when they’re kept for wool). For me going veg was an ethical choice because of animal treatment issues, so learning about the wool industry was especially disheartening. I’m definitely going to check out Humanitaire’s line, thanks so much! I love earth divas and their items are for sale at Fair World Partners, check them out!